The “Points of View” art exhibition will run through April 30th at the Prominent Properties Sotheby’s International Realty Montclair office located at 32 Valley Road. 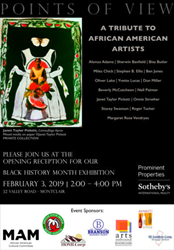 In honor of Black History Month, NJ Lenders Corp. was proud to co-sponsor the opening reception for the art exhibition “Points of View: A Tribute to African American Artists,” which was hosted by the Prominent Properties Sotheby’s International Realty Montclair office on Sunday, February 3rd. Approximately 400 people attended the event, which is now the seventh art exhibition to be hosted by the Montclair regional office. "The art exhibition is such a great event that Sotheby's holds, and as a company, NJ Lenders is just happy to be a part of something that the local community can enjoy," said Ryan Barry, Senior Loan Officer at NJ Lenders Corp. The exhibition features 40 pieces of art and the work of 16 African American artists. Amongst them is the late work of Don Miller, the artist who painted the mural for the main lobby of the Martin Luther King Jr. Memorial Library in Washington D.C.
Other artists being featured include Alonzo Adams, Sherwin Banfield, Bisa Butler, Miles Chick, Stephen B. Ellis, Ben Jones, Oliver Lake, Yvette Lucas, Beverly McCutcheon, Neil Painter, Janet Taylor Pickett, Onnie Strother, Stacey Swanson, Roger Tucker, and Margaret Rose Vendryes. Attendees also enjoyed steel drum music from Sterling C. Sample, while interior designer, author, and entrepreneur Robin Wilson autographed and gave away free copies of her book. Other sponsors for the event include the African American Cultural Committee of the Montclair Art Museum, The Montclair African-American Heritage Foundation, Inc., HOMECorp., Branson Insurance Agency, Arts Unbound Showcase, and Amanti Vino. For additional information about the event and the exhibition, visit http://www.facebook.com/ArtinMontclairPPSIR/ or call the Prominent Properties Sotheby’s International Realty, Montclair regional office at 973.783.6900. Founded in 1991, NJ Lenders is a leading NJ-based residential mortgage banker that is privately owned and licensed. The company currently originates first mortgage loans in NJ, NY, CT, PA, VA, MD, and FL. With 11 offices and over $25 billion in closed mortgage loans, many of their Mortgage Loan Originators are recognized nationally as the best in their field. The company has competitive rates and fees with a wide variety of mortgage programs to select from.